Robotics engineers are setting up the worksite on the Port 6 truss today ahead of next week’s spacewalk. Ground teams are remotely maneuvering the Canadarm2 with the Dextre robotic hand attached to relocate a leaky pump flow control subassembly (PFCS). The Canadarm2 will then be positioned afterward to support Arnold’s and Feustel’s work next week. The duo will work outside the station for about 6.5 hours to swap locations of 2 PFCS boxes. The PFCS controls the circulation of ammonia to keep station systems cool. Other spacewalk tasks planned in the timeline include swapping out a variety of communications gear. The two spacewalkers gathered their tools and were joined on Tuesday by Flight Engineers Scott Tingle and Norishige Kanai for a spacewalk procedures review. 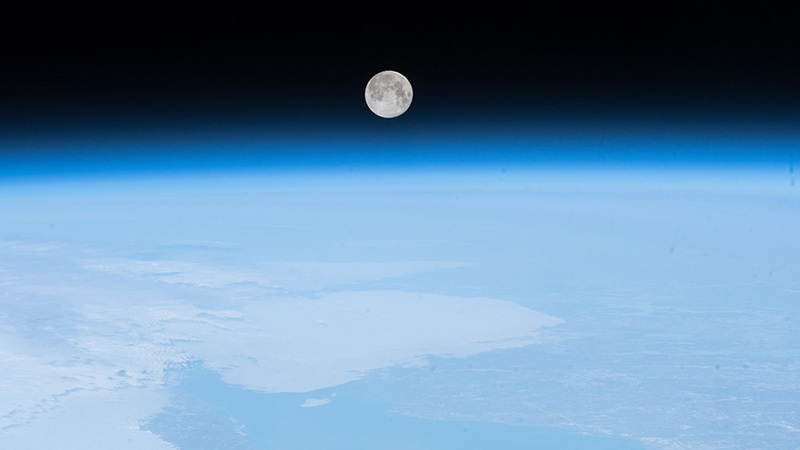 The foursome also checked in with mission controllers to discuss the upcoming spacewalk. Tingle and Kanai will assist the spacewalkers in and out of their spacesuits next week and help choreograph the excursion. Astronaut Ricky Arnold completes the scrubbing of water cooling loops inside a pair of U.S. spacesuits after the completion of spacewalk on March 29, 2018. 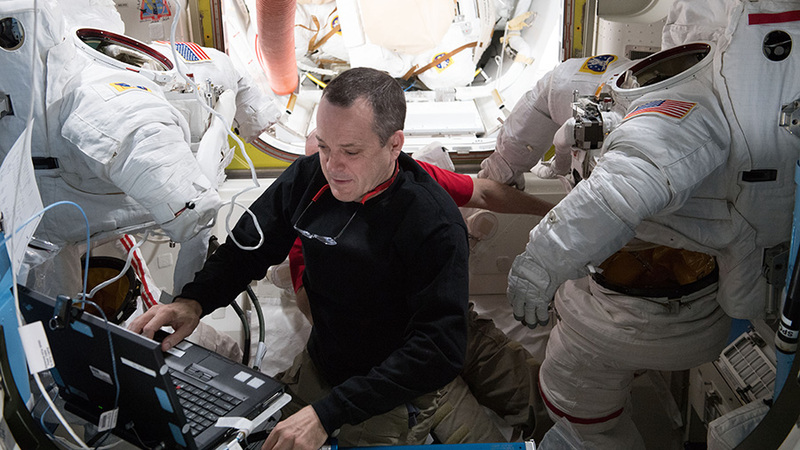 NASA astronauts Ricky Arnold and Drew Feustel are assembling hardware today that will be installed on the International Space Station when they conduct a spacewalk on May 16. The duo were assisted throughout the day by fellow NASA astronaut Scott Tingle scrubbing U.S. spacesuit water cooling loops and testing water samples for conductivity. The veteran spacewalkers were mating repaired components from an external television camera group (ETVCG) that will be attached to the starboard side of the Destiny laboratory module. Their primary spacewalking task however, will be the swap out of thermal control gear that circulates ammonia to keep station systems cool. Final packing is taking place inside the Dragon space freighter today as Tingle loads critical time-sensitive research samples inside the Earth-bound resupply ship. Robotics controllers will detach Dragon from the Harmony module Friday before releasing it Saturday at 9:24 a.m. from the grips of the Canadarm2. NASA TV will begin its live broadcast of the departure at 9 a.m. but will not televise its 3 p.m. splashdown in the Pacific Ocean. NASA astronaut Scott Tingle replaces a failed light bulb in a light to be used on a new external television camera group (ETVCG) that will be installed on an upcoming spacewalk. 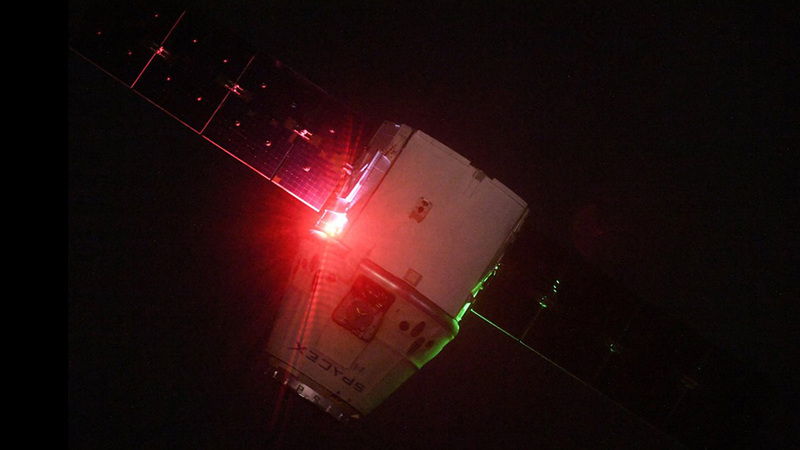 The SpaceX Dragon resupply ship’s stay at the International Space Station has been extended until Saturday after unfavorable conditions were reported at the splashdown zone in the Pacific Ocean. In the meantime, time-sensitive payloads are still being readied for return to Earth as the crew wraps up final cargo packing. Robotics controllers will operate the Canadarm2 to detach Dragon from the International Space Station’s Harmony module on Friday. It will be remotely released into Earth orbit Saturday at 9:24 a.m. EDT before finally splashing down in the Pacific Ocean around 3 p.m. Flight Engineer Scott Tingle will be in the Cupola monitoring Dragon as it slowly backs away from the space station. NASA TV’s live coverage of Dragon’s departure begins Saturday at 9 a.m. The space freighter’s parachuted splashdown 403 miles off the coast of Long Beach, Calif. will not be televised. 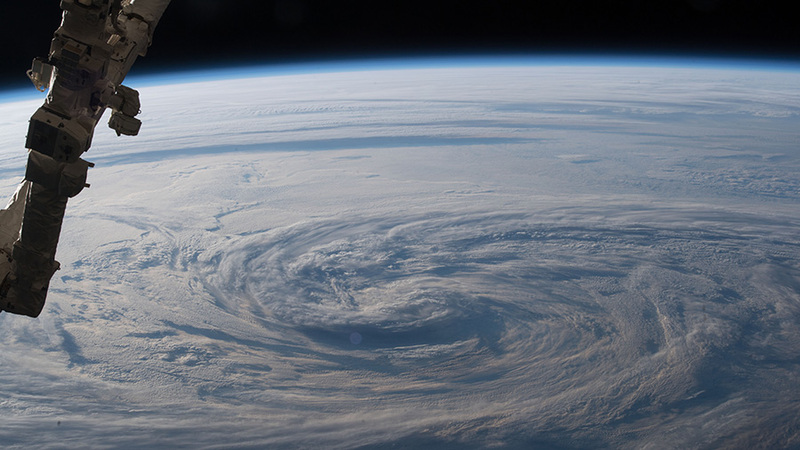 Two NASA astronauts are looking ahead to their next spacewalk scheduled for May 16. Veteran spacewalkers Ricky Arnold and Drew Feustel took their body measurements today to ensure a proper fit inside their U.S. spacesuits. 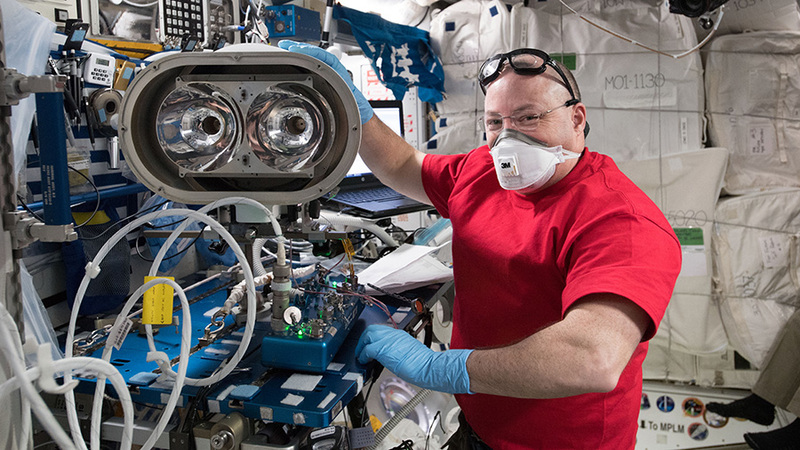 The duo will work outside the orbital lab for about 6.5 hours to swap out thermal control gear that circulates ammonia to keep station systems cool. Japanese astronaut Norishige Kanai, who will assist the spacewalkers in two weeks, began configuring the Quest airlock where the 210th spacewalk at the station will be staged. He also trained to detect and clean ammonia from the spacesuits should they become contaminated during the maintenance spacewalk. 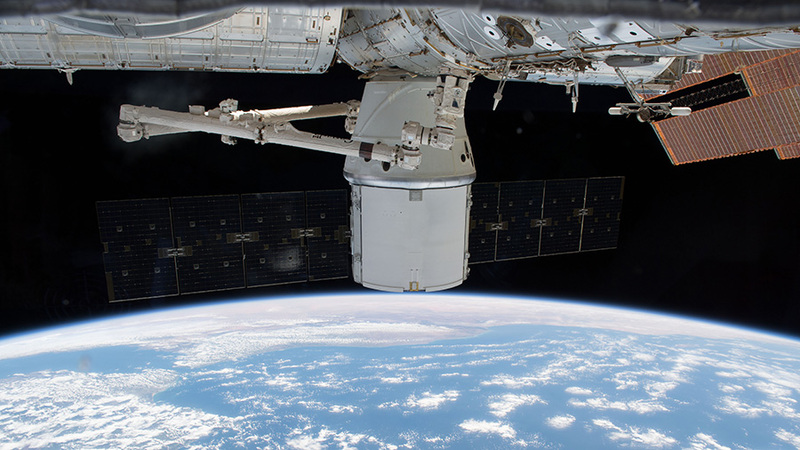 The SpaceX Dragon resupply ship was gripped by the Canadarm2 robotic arm on April 27, 2018 in preparation for its detachment from the Harmony module and its release back to Earth for splashdown and retrieval in the Pacific Ocean. The SpaceX Dragon resupply ship is packed with International Space Station hardware and scientific samples ready for return to Earth on Saturday. Meanwhile, the Expedition 55 crew members continued maintenance of the orbital lab and space research operations. 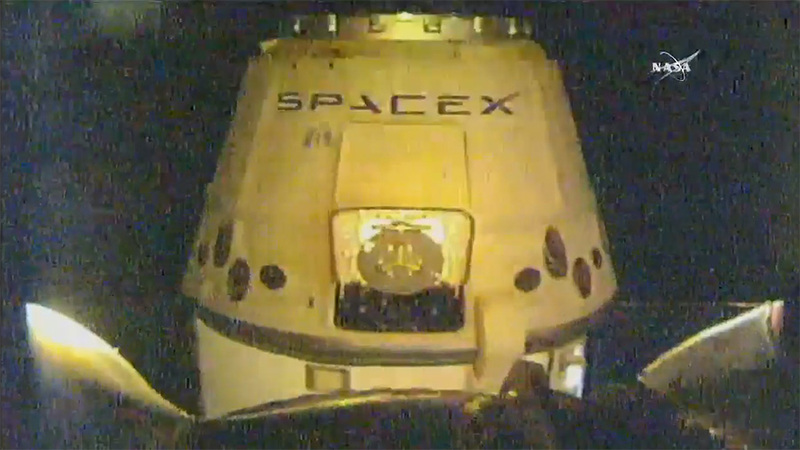 Dragon’s departure was pushed back from Wednesday after SpaceX personnel observed high sea states in the Pacific Ocean splashdown zone southwest of Long Beach, California. Its remotely controlled release from the Canadarm2 is now scheduled for Saturday at 9:30 a.m. EDT with live NASA TV coverage beginning at 9 a.m. Dragon’s splashdown is targeted at about 3 p.m. but will not be seen on NASA TV. Mice living on the station have been transferred to specialized habitats in Dragon. They will be studied on Earth to observe how their bones and muscles have changed during their stay in microgravity. Other critical biological samples preserved in science freezers, such as plants, insects and human tissue, have also been transferred into Dragon for retrieval and analysis. The astronauts and cosmonauts living on the space station exercise every day to maintain strong bones and muscles on orbit. One of the workout machines, the Advanced Resistance Exercise Device (ARED), got a tune up today amid the Dragon close out activities. Flight Engineer Drew Feustel greased the ARED’s rails and rollers and inspected its x-axis rotation points.